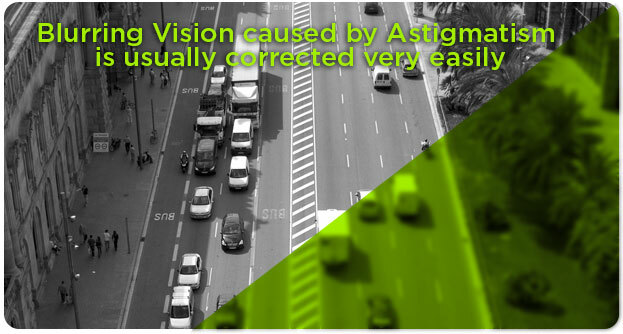 Astigmatism is a common vision condition, the primary symptom being blurry vision. However, a wide variety of other vision conditions can also lead to blurred vision. So, if your eyesight isn’t sharp, we invite you to visit your Washington, DC, optometrist for an eye exam and detailed diagnosis. During your eye exam, we will inspect your vision and eye health to determine if you have a vision problem and to recommend the most effective treatment. If we diagnose astigmatism, our Washington, DC, optometrist is experienced and skilled in treating this condition. The normal, healthy eye is a round shape. Astigmatism occurs when your cornea is irregular and not fully round. In reality, almost everyone has some degree of astigmatism, but it only causes blurred vision if it is present at a certain degree. To understand what happens with astigmatism, think of your eye as a spherical ball. Normally, when light enters the eye it bends evenly. As a result, a crisp image of what you see is projected on the tissues at the back of your inner eye. However, when you have astigmatism your eye resembles the elliptical shape of a football. Consequently, light is not bent evenly and only one part of the picture is conveyed in focus at a time – resulting in a distorted image. Wavy or blurred vision is the most common symptoms of astigmatism. Regardless of how close or far an object is, your view will be distorted and you won’t be able to bring the object into focus. Other symptoms include eye strain and fatigue, as well as squinting. If you experience these symptoms, book a comprehensive eye exam with our Washington, DC, optometrist to find out whether you have astigmatism or a different vision problem. Usually, astigmatism is corrected successfully with eyeglasses or contact lenses. To treat astigmatism, you will require a vision prescription with an additional cylinder lens power. If glasses or contact lenses are insufficient and cannot correct your astigmatism, then surgery may be necessary. It is typical for astigmatism to occur along with other vision conditions, such as nearsightedness or farsightedness. Our Washington, DC, optometrist will check that your vision prescription corrects all refractive error at the same time as it corrects your astigmatism. Over time, astigmatism can worsen – so be on the watch for any changes. If you notice that your vision becomes blurry again, it is time to book an eye exam! As we age, our eyesight may decline. This is called presbyopia, and treatment is available! Ask your optometrist at Washington Eye Doctors about presbyopia diagnosis and treatment options.